For a mobile phone that has been out for less than five years, the iPhone has made some extremely impressive strides since 2007. In recent years however, we’ve seen improved smartphones coming to market with the most notable iPhone competitors being various touchscreen devices running Google’s Android OS. According to a report from Nielsen, when looking at smartphone operating system numbers in the USA, iOS reigns supreme. However, Apple’s iOS lead may not last forever. Android is picking up users very quickly. As Nielsen further indicates,Â according to November data, “the popularity of the Android OS among those who purchased a smartphone in the last six months (40%) makes it the leading OS among recent acquirers”. But despite its surge among recent acquirers, when it comes to overall consumer market share, Android OS (25.8%) is still behind Apple iOS (28.6%). 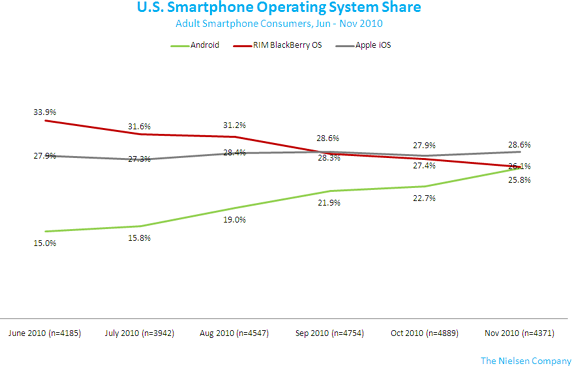 RIM Blackberryâ€™s position is less clear: Its share (26.1%) puts it within the margin of error of both Apple iOS and Android. 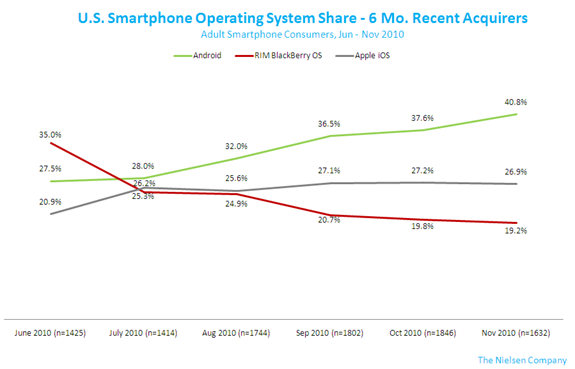 In other words, RIM remains statistically tied with both Apple for first and Android for third. Appleâ€™s clear lead over Android notwithstanding, this race might still be too close to call. This data is likely very similar to that found in Canada as well, since Android devices have not completely saturated the Canadian wireless landscape. Overall it seems that Apple’s iOS still leads by a slim margin, but the question is, for how long? Will your next smartphone be an Android-based device?